If you have high-quality knives like a paring knife, a chef knife, a steak knife, a serrated utility knife or even a sushi knife, then you definitely don’t want to just leave them lying around in a drawer. You want to make sure that they are protected from anything and that the edges are going to stay sharp. Not only that, you want to make sure you’re protected when you’re reaching into your drawers for a knife. With a knife block, you’re going to prolong the sharpness of your knives and you’re going to prolong their lifespan as well. They’ll stay in much better shape when the edges are protected from banging against each other and against other objects. They’ll also stay looking great so you don’t need to worry about buying another set of knives. 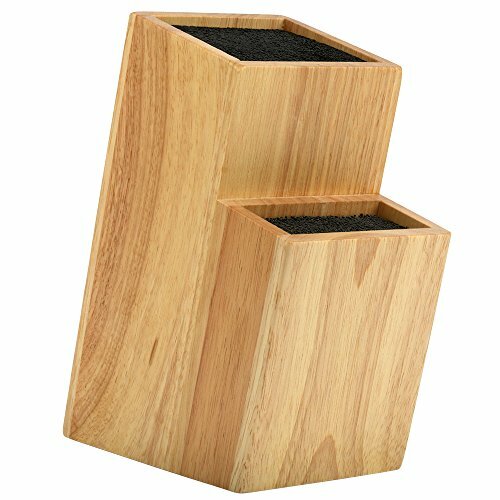 If you’re considering a knife block you’ve probably already at least looked at the options that are out there. Have you actually looked at the specific features of those blocks, though? Have you really considered why one may or may not be better than a different one? You should be thinking about those things. Luckily for you, we’ve looked at each of those things and we’ve created a list that will help you choose just the right one for your favorite knives. You want to keep them safe and we want to help you do it. With the right knife block that’s not going to be a problem. As you go through this buying guide, you’ll see several different features that are going to help you choose one that works best for you. You’re also going to see several different blocks so that you don’t have to go through all the options that we’ve already looked at for you. We’ve narrowed things down and given you a head start. We’re going to focus on: Material, Spaces, and if after everything, you get a complete set of knives out of your purchase or not. You won’t be storing any electric knives in these blocks, so buckle up as we look at all the most important things you should be considering before making a purchase. The first thing that you’ll want to take a look at is the overall material of the block. There are several different materials that you can choose from with some of the more common being steel or wood. If you’re looking to get away a little bit cheaper you can find a number of different options that are made with plastic or some type of acrylic as well but these are generally not as durable, not as strong and definitely not as aesthetic in your kitchen. Keep in mind that your knife block is likely going to sit out in your kitchen. You want it to be something that you’re proud to show off to anyone that walks into your home or your kitchen. Steel or wood will generally last longer and they provide a more sleek look. Bamboo and steel are some of the most popular versions out there right now, but keep in mind that there are a lot of different features that go along with these. It’s not just about the exterior material. You’ll want to look at the actual colors or grains that go into it as well as the features that are included in the next section we’re going to look at, the overall size and shape of the block itself. A square or rectangular design is the most common, but custom blocks could be any shape. You can actually have a custom-made block in any style or any material that you may want for your kitchen. The spaces that are included are going to focus on two different areas. First, you’re going to be looking at the number of spaces. Just how big is your knife block going to be and how many knives is it going to hold? If you have a lot of knives already you may want to look at a larger block. On the other hand, if you don’t have a lot of knives and you don’t plan to get very many more you may want to look at something a little smaller. If you have a few empty spaces that’s fine (especially if you’re planning on filling it eventually) but you don’t want too many empty spaces that you’re never going to fill. The next aspect to look at is the type of knives that are going to fit. You won’t have spaces for as many different types of knives as you have (or at least a good share of them). You don’t want to have to keep any of your good knives sitting in that drawer, after all. So, consider the different types of slots that are in the knife block you’re looking at. Each different type of knife is going to need a different type of slot, after all, and they’re each going to be labeled in any knife block that you choose. (The labeling is generally in the instruction manual and not on the actual knife block.) Either way, you’ll be able to store plenty of knives in a single block, depending on the specifics of the block that you choose. Do you want a complete set of knives that will come with everything that you need or are you looking for a block that’s going to work with the knives that you already have? This is a feature that you’re going to need to at least look at as well. Some people prefer to buy a whole new set of knives just so they can have the complete set and make sure they’re going to fit comfortably on the block that they purchase. Others prefer to use their own knives whether they form a matched set or not. It’s going to be entirely up to you which way you choose to go about buying your block. Keep in mind that most knives are going to be standard sizes, which means that a universal block should work fine for what you already have. Below are our favorite picks to store your kitchen knives. One of these blocks actually comes with a full set of knives, so you’ll have a backup set if you have a set of knives you already love and are just looking for the best possible block you can find to store them. Overall, all of these choices have adequate space and should provide plenty of storage for any knife enthusiast. Let’s jump in and look at our favorite blocks. 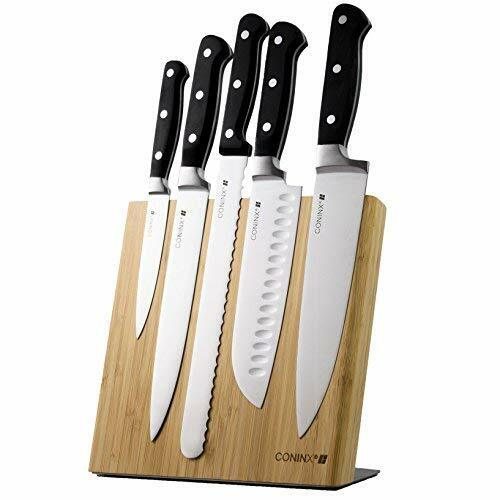 If you’re looking for a complete set of knives this is a great choice to go with. The knives are made of stainless steel and you get a little bit of everything to get you started. They’re made by a company that’s known for quality without being too expensive and each has a hollow handle that makes them durable and full tang but without the extra weight that all that other steel could incur. You get 12 knives that include steak knives, paring knives and more as well as a sharpener and a pair of scissors that makes it easier for you to cut through anything you need in the kitchen. The blades are high carbon stainless steel, which increases their strength, their accuracy, and their sharpness and they have an acrylic block that holds all of them carefully and safely. The handles are ergonomic so they’re easier for you to hold for an extended period while you’re cutting anything and they are very easy to clean and sharpen whenever you need to. They come with a lifetime warranty so you know you’re getting something durable and ready to go. If there’s ever a problem you can just contact the company to find out what to do. This universal knife block actually has 20 slots so you’ll be able to put anything you need in here. It’s sized so that you can put in 19 different knives as well as a pair of kitchen scissors and a sharpening rod so you’re going to be set to go each time you walk into the kitchen. The angled edges make it easier to put the knives in or take them out as needed and the horizontal layout also means that there’s less wear on your knives when you store them. 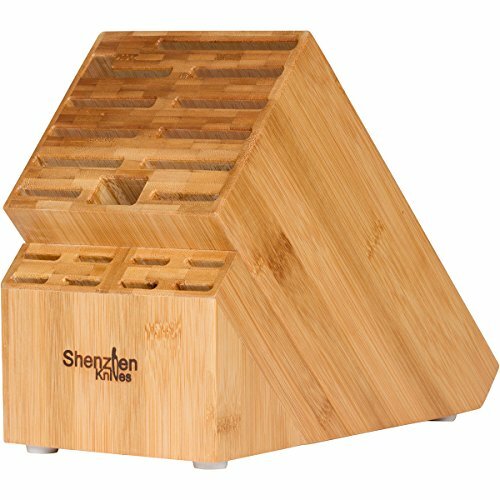 It’s made with bamboo veneer to provide a sleek and stylish look that will easily fit in with just about any kitchen design and has a wood core that’s durable and long-lasting. The block itself has non-skid feet that keep it right where you want it on the countertop and the slots are all different sizes so you can easily put anything from simple steak knives (several of them) to larger chef’s knives and even meat cleavers into the block. There’s plenty of space for everything and you’ll be able to easily get those knives out of your drawers where they’re taking up way too much space. If you want something that’s going to hold a few knives without damaging anything and without even keeping them out of sight then this is a great option for you. It’s sleek in style with the bamboo design and it features a magnetic finish on the inside that makes sure your knives will stick firmly without any cause for concern. You can trust it to stay right where you want it because of the non-slip base and you can trust that the magnet on the inside is strong enough to hold any of your favorite knives. You just stick your knives to the outer edge of the block and it will keep them right there so they’re ready when you are. You’ll be able to put any knives that you want on this block because they’re actually attached to the outside rather than needing to slide into any specific slots. This makes the block even more versatile than most other options though it does hold a few fewer knives overall. You’ll be able to make your favorite knives a discussion piece and an accent in your kitchen. Not to mention the 100% sustainable bamboo block is going to cause a bit of a stir as well. 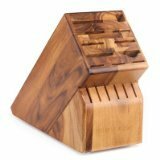 Made of acacia wood, this block has a stylish and sleek look to it that’s going to look great on your kitchen counter or anywhere you want to display it. The wood is polished to shine and there are 17 different slots that allow you to put your best knives away without any reason to worry. The angled aspect of the block itself means that your knives are protected and it keeps them nice and sharp. There’s even space for you to put your kitchen shears and your sharpening rod so everything is together at all times and there’s no more searching for it. You can put 2 chef or santoku knives as well as 6 steak knives and 7 additional large knives into this block and not have to worry about them sliding or moving. The slots are cut just right to hold the knives securely and the block itself is designed to never slip because it’s built with a rubberized base that holds it right where you put it. You can put all of your great quality knives away and never worry about them again. The final option we have is another unique option. It actually has two different tiers of flex rods that are designed to hold your knives firmly but keep whichever ones you want. Instead of slots that are designed for your specific knives, this block actually has rods that will move around wherever they need to in order to hold any knives that you want. You can put any combination in here with the flex rods to hold them upright and to keep them away from each other at the same time. The rods can be removed at any time and you’ll easily be able to put them in the dishwasher if you need to clean them. You can even put larger knives that are up to 8” long in this block. You won’t need to be limited by the spaces that are included in traditional blocks but you definitely will be able to swap out different knives in the boxes whenever you want. You can store different knives at different times so they’re available when you need them. 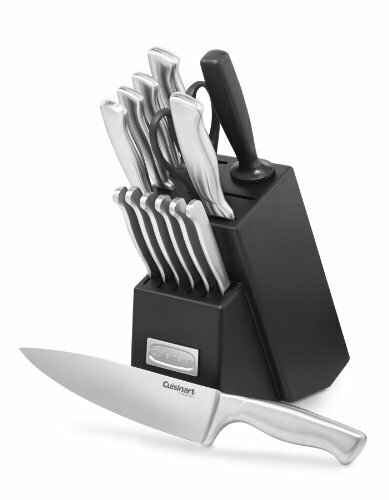 Overall, there are a number of different knife block options that you can choose from. In the end, it’s going to be up to you which block is the best option and which one will hold the knives that you need, when you need them and how you want them.